Kind regards from us at the Norwegian Glacier Museum & Ulltveit-Moe climate centre. Fjaerland Guiding offers tailormade hikes and events on request. Smiling guides gives you fairytale adventures packed with good stories and local knowledge. From the Skeidsnipa traverse (photo: Pål G. Kielland). In summer season Fjaerland Guiding offers open glacier walks on glaciers close to Fjaerland. Information will be available consecutively at Fjaerland Tourist Information, and hotels and campings nearby during the summer. For special requested glacier walks, please contact Fjaerland Guiding. Easy but great walk in the fantastic surroundings in front of Bøyabreen Glacier (photo: Pål Gran Kielland). Thanks for 2016! Welcome back to Fjærland and the Norwegian Glacier Museum & Ulltveit-Moe Climate Centre in 2017. The season begins on April 1. Greetings from the glacier team! Welcome back to us and Fjærland in 2016! The museum is open from April 1st. Next year with a brand new design! And also, in 2016 the museum celebrates 25 years anniversary. We still have about half a meter of snow surrounding the museum, but we are soon opening the doors for a new season. On April 1. we are open every day from 10:00 to 16:00. Click here for prices and opening hours. Welcome to the Norwegian Glacier Museum in 2015! The Norwegian Glacier Museum is a proud partner in the Tunsbergdalsbreen Project. This is an international project with the aim of making young people aware of climate change and the way glaciers react to these changes. From the expedition in 2013. Photo: Julie Berg/Tunsbergdalsbreen Project. Expedition to Tunsbergdalsbreen, the largets outlet glacier from Jostedalsbreen ice cap in Western Norway, is arranged annually. The project is a cooperation of The Norwegian Glacier Museum and the UK charity organisations Field Studies Council Blencathra Centre and Brathay Exploration Trust. The Norwegian Glacier Museum has done the annual front position measurements on four glaciers. 2014 turns out to be a bad year. For many years, we have measured front position changes on glaciers in Fjærland. The first glacier measurement series started on Supphellebreen Glacier in 1992, while we added Bøyabreen Glacier in 2003. These glacier has been retreating over the years, so we started measuring two additional glaciers; Supphellebreen Glacier in 2011 and Haugabreen Glacier (in Jølster) last year. Haugabreen Glacier October 2014. Photo: Pål Gran Kielland. 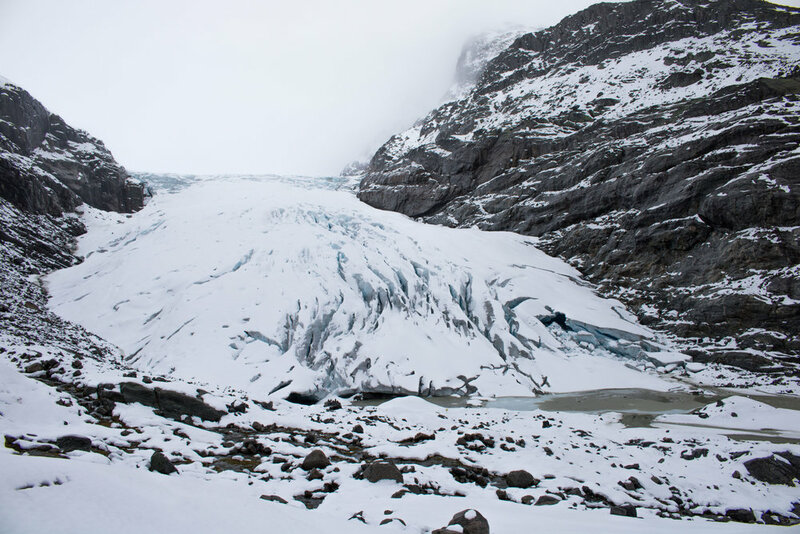 While the measurements of Vetle Supphellebreen Glacier and Haugabreen Glacier are done directly on active outlet glaciers, the measurements on Supphellebreen Glacier and Bøyabreen Glacier are done on so-called regenerated glaciers. These are glaciers which forms by ice and snow avalanches from the glacier and mountain above. They can change from year to year based on where the avalanches accumulates. In 2014 there is observed low avalanche activity, meaning less ice and snow masses added to the regenerated glaciers. Also, the melting season has been warmer than normal and they are situated at low elevations. Bøyabreen Glacier at 150 m.a.s.l. and Supphellebreen Glacier at 60 m.a.s.l. The result is glacier retreat, especially Bøyabreen Glacier with 65 metres while Supphellebreen Glacier retreated 18 metres. Bøyabreen Glacier October 2014. Photo: Pål Gran Kielland. The fronts of Haugabreen Glacier and Vetle Supphellebreen Glacier are situated at higher elevations than the regenerated glaciers and, hence, should stand the summer season melting better. Haugabreen Glacier (900 m.a.s.l.) retreated 13 metres, while Vetle Supphellebreen Glacier (750 m.a.s.l.) retreated 31 metres. These numbers tell us that the warm summer has been hard on the ice, also at higher elevations. This has been observed several places, for example in the area above where the ice fall starts on Bøyabreen (1200 m.a.s.l), where old blue ice is appearing from melting at 15-1600 m.a.s.l. Bøyabreen Glacier ice fall September 2014. Photo: Pål Gran Kielland. These glacier measurements are done on behalf of NVE (Norwegian Water Resources and Energy Directorate). The summer is almost over, but in the glacier village of Fjærland all the fun continues with the very distinctive Round Bale Festival. Here you will get art and culture mixed with feisty activities, in a place where round bale covered fields meets glaciers, rising mountains and a deep fjord. Photo: The Round Bale Festival. The festival is an attraction by it self, with the Round Bale World Cup as the highlight! For more information, see Rundballefestivalen on Facebook (if you dare to read Norwegian). Welcome to a new season at the Norwegian Glacier Museum & Ulltveit-Moe Climate Centre. We are open every day 10:00 - 16:00 from April 1. This year we are presenting new exhibitions outdoors and re-newals in the museum. Follow us here on our website, or in soical medias like Facebook, Instagram or Twitter. The mammoths are popular with the kids! Photo: Gaute D. Bøyum, 2013. Expedition: Explore glaciers in Norway! Always wanted to get on a glacier? Or maybe a taste of glaciology has left you wanting more? Then this exciting expedition is for you! From the expedition in 2013. Glaciers are cool! Where? The Jostedalsbreen Ice Cap in Southern Norway, which is the largest glacier on the European continent. Download the flier from Brathay Exploration Group Trust. The expedition is suitable for ages 16-21 with good level of fitness. Finally, we can present our new and modern website! It has a responsive design, which mean it works well on all units; computers, tablets or smartphones. The website also has information in 8 other languages, besides Norwegian, English and Deutsch. Hopefully, we can satisfy a wide range of nationalities. We thank GASTA in Sogndal for the cooperation in developing the new website!